When homeowners build pools, it is always with the intention of providing the best outdoor area for relaxation and recreation. There are extra ways to make your pool area “the place to be” for your family and that is by adding additional features that will make swimming a level higher and deeper – diving. An ideal diving-ready pool, according to pool contractors should be at least 38 to 39 ft.-long with a minimum depth of 12 ft. This is to prevent diving into the shallow part of the pool. If you are building a new pool, this information might be handy. If you have an existing one, it is best to research your pool diving board options because each one offers the flexibility to fit in your specific pool size. These are just the initial information you will need to choose the best pool diving board for your need and we’re about to give you more. Let’s get started! 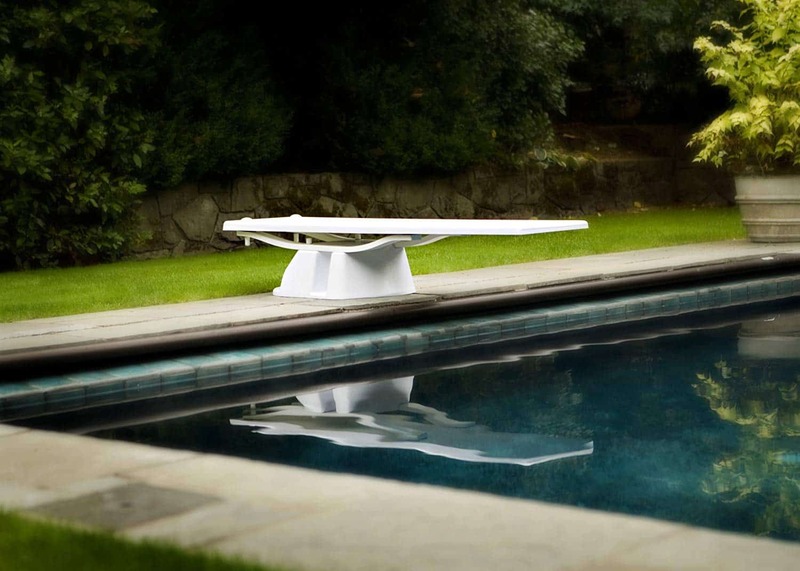 This hip and cool-looking diving board comes as a board and stand. It is uniquely shaped to match any pool theme and style. It also comes in three versatile colors that will make it a stand-out piece for your pool. Choose between the discreet Radiant White, the subtle Sandstone and the masculine Gray Granite. 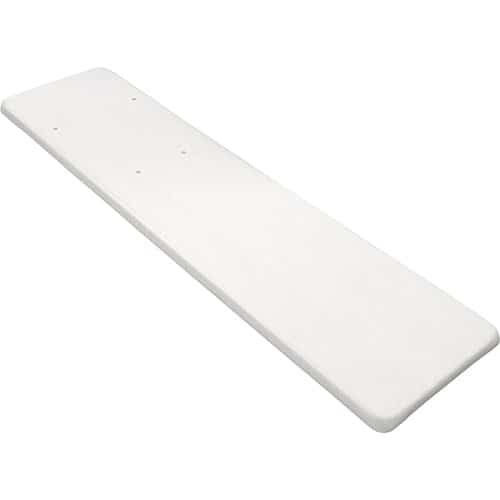 The board comes with an anti-slip tread called SureFoot for maximum safety. The D-Lux Stand that comes with the HipHop board is built using a composite material to guarantee increased strength and stability. The hardware is made from 316 stainless steel which means it is most suitable and will remain corrosion free in chloride environments like a swimming pool. If your pool needs a diving board with a character, this HipHop Diving Board with D-Lux Dive Stand combined uniqueness and functionality. It is not too bouncy so it is perfect for those who are looking for a system that will provide maximum diving safety, especially for children. 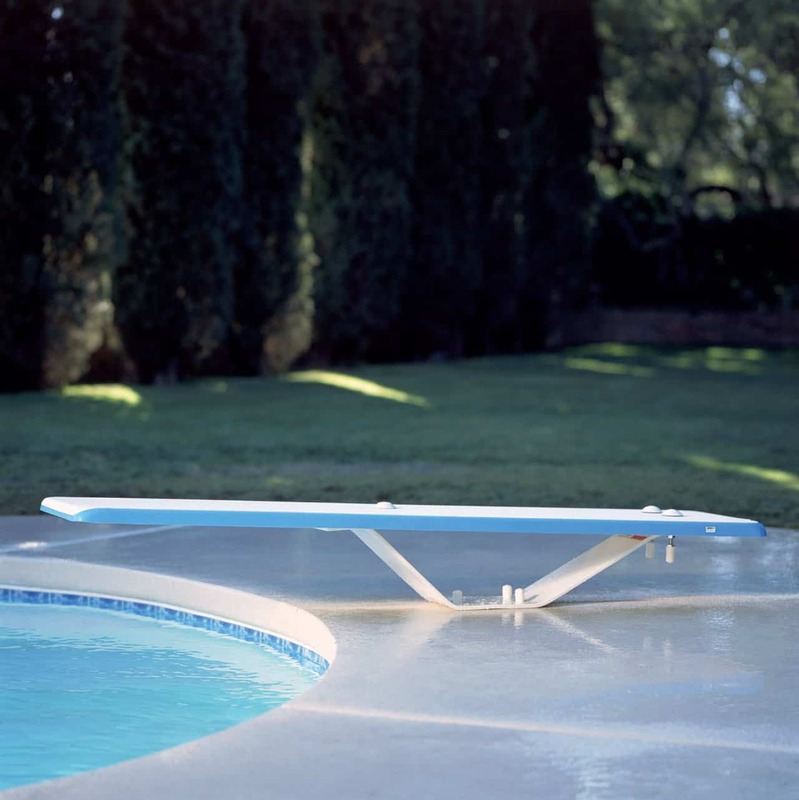 This diving board offers a classic look yet a revolutionary performance by sporting a modern look and durable materials. It is perfect for first-time users and it also is a great replacement option as it is compatible with most S.R. Smith stands and installation is a breeze. It is offered in five different colors to match the color of your pool and slide. The blue and white option will make you look like a pro, gray on gray and gray on white will fit a modern pool, taupe and tan for the zen feel and red for the ones who want to make the board stand out. This variant takes pride in its TrueTread feature that makes it feet friendly with the right amount of grip. ​It comes in 6-ft. and 8-ft. sizes. If you want to add a sporty or athletic feel to your pool, this is exactly the diving board you are looking for. However, it might fall short on your expectation on the bounce part, it doesn’t exactly feel sporty at all. This diving board and stand set to give the “spring” feel that most users look for in a pool diving board. It is suitable for moderate use in residential pools and supports up to 250 pounds. It comes in two colors for the diving board – Radiant White and Taupe. It is also available in two sizes, 6.ft and 8.ft long. While the stand is powder coated in Radiant White. The powder coating guarantees that the base’s aesthetic appeal will last a long time. The board is equipped with a SureFoot non-slip tread that offers extra safety by ensuring a good grip for children and adult users. The set comes with all the necessary hardware and an instructional diving video to provide users with tips to ensure the most enjoyable and safest usage experience. ​Only two colors to choose from and both are a dirt magnet. If the light-colored options do not bother you at all and the ultimate bounce is what you need, the Frontier II diving board and stand set is the most suitable one for you. Finding a guaranteed salt pool-friendly diving board might be challenging but now when you browse through S.R. Smith’s wide range of pool diving boards. 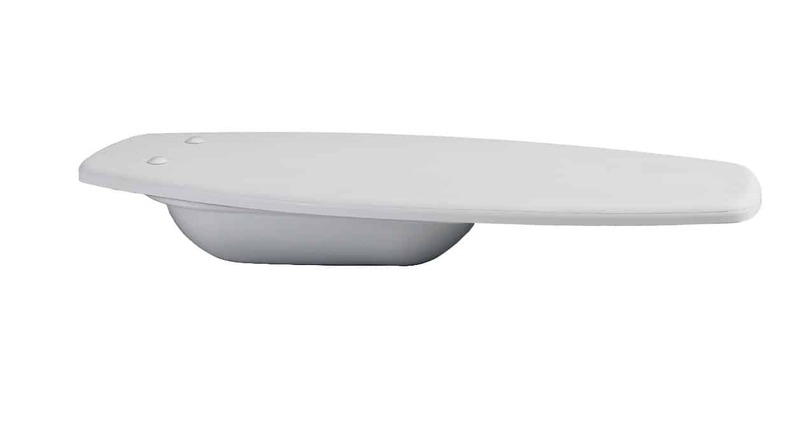 Flyte-Deck II is suitable for saltwater pools – from the board to base. The board is made with acrylic reinforced fiberglass with a slip-resistant treaded surface. The powder coated steel base is made with 316 stainless steel hardware that will remain rust-free. The whole system has a weight limit of 250 pounds. 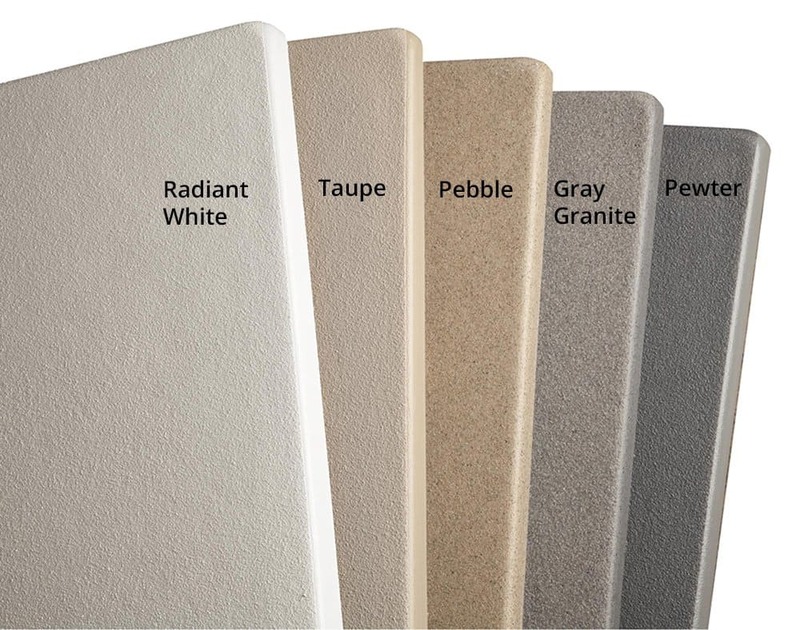 It comes in five (5) earthy and natural colors – Radiant White, Taupe, Pebble, Gray Granite and Pewter. The board comes in two lengths, 6 ft. and 8 ft.
Not everyone enjoys the springiness of a diving board. A board that offers a more stable feel gives a secure feeling to any users. This board provides that and the durability to remain corrosion-free in the salt pool environment. The Cantilever Jump Stand and the Frontier III Diving Board is the power combo for pool diving board sets from S.R Smith. This set is recommended for light to moderate use but promises to provide a premium look and feel to your pool. The set comes with a diving board, jump stand, jig and two springs. All you have to do is contact a pool contractor in case you need assistance on the installation but it comes with a manual and the setup should be easy. 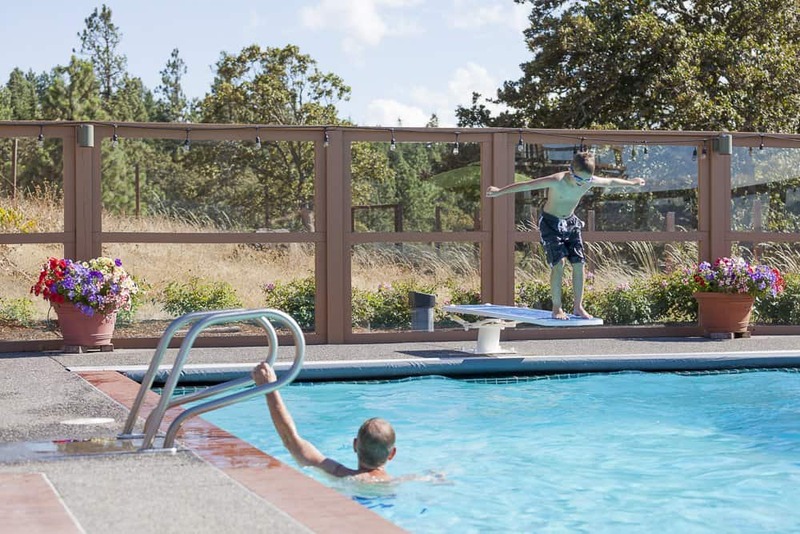 It offers the springy feel that kids and adults alike are looking for in a diving board. To best enjoy diving in your pool as safely as possible, S.R. Smith included a safety diving instructional video for your family’s reference. You will feel and look like a pro using this diving board. The sleek and clean look and the springy feel it offers guarantees hours of fun in your pool and years of enjoyment using this durable diving board set. Frontier III diving board’s surface is slip-proofed with its SandTread texture. It is available in 6 ft. and 8 ft. The Salt Pool Jump System is one of S.R. Smith’s most flexible system so you can be assured of the bounce that you expect and look for in a diving board set. The whole system is offered in three colors – Radiant White, Pewter Gray and Taupe. Replacement diving boards are available with three more colors to choose from – Gray Granite, Marine Blue and Pebble. The grip the surface of this board has offers a more secure feeling to its users. It is also perfect for those who are looking for stability and safety over the bounce a diving board can offer. Duro-Beam Aqua Board from Inter-Fab is made with extra thick Douglas fir wood core runners, reinforced fiberglass and skid-resistant acrylic surface as a safety feature. It is recommended for light to moderate use and offers lesser flexibility, perfect for kids and starters at pool jumping and diving. It is available in 6 ft. and 8 ft. length and in four (4) color options – White, White and Blue, Gray, and Tan. It supports up to 250 lbs. of weight. In the replacement board category, this might be one of the most affordable and durable you will come across. However, it is essential to always check compatibility with your existing stand before buying one. Duro-Spring Diving Board offers that extra bounce and springiness for more hours of fun in your pool. It is compatible with Duro-Spring Diving Stand only and it is made durable with Douglas fir laminated wood core, fiberglass and resin protective coating for maximum strength. The surface is covered in a durable UV protected and anti-slip surface for your safety. Just like most diving boards, the weight limitations of the Duro-Spring is 250 lbs. There are five colors to suit your taste and your pool’s them – white on white, tan on tan, gray on gray, blue on white and black on gray. Wear of pool accessories installed on salt pools is faster than on tap water pools. You can now easily find a replacement for your salt pool diving board. The three (3) warranty also builds buyer confidence to this product. It is true that not everyone can just install a pool diving board. So before purchasing one, it is essential to discuss with a trusted pool contractor to be guided on pool diving board safety guidelines. It is also important to refer to this guide from American National Standards Institute (ANSI) (Table 1) and S.R. Smith (Table 2) which elaborates the minimum requirements regarding size and depth of your pool for specific board size. If there is no one size fits all for pool diving boards, variant and model is also among your top considerations. There are to types of water used in pools – tap or well water and salt or ocean water. Salt-friendly pool accessories and gear are made available to ensure that it can be used for a long time by salt pool owners without the worry on corrosion. Some pool diving board systems are made in this consideration as well, these are the salt-friendly ones. For S.R. Smith brand, for example, they have three variants to choose from salt pools which materials are made with fiberglass, composite springs, 316 stainless steel hardware. All of these materials are guaranteed corrosion-resistant. When it comes to diving boards, fun levels up as your jumping goes higher, and “springy” diving boards offer just that. But not all pool owners are keen on the idea especially those with pool depths that are shallower than 12 ft. Choose diving boards with average to light bounce especially if you have a handful of children using the pool. Your diving board manual comes with care instructions from installation to maintenance. Include your diving board when brushing and vacuuming your pool. Make sure to use a brush with softer bristles. This will prolong the life of your diving board, freeing it from body oils on the surface that will make it slippery, remove stains and protect its proprietary tread for added grip. Weatherproof Pool Diving Board Cover - 8-ft. They key to your ultimate enjoyment in installing your pool diving board is safety. By following the safety guidelines before installing one, by designing your pool in such a way that it can accommodate one, by choosing the most suitable features and flexibility for your need and by setting your very own house rules during use, you can surely guarantee pool safety. This diving board system is flexible in every way possible. It can be used in either tap or salt water pool, the colors will match and complement any pool color or theme, it offers the bounce that children and adults will enjoy in a pool diving board and it comes with a board, dive stand, mounting hardware and spring set. 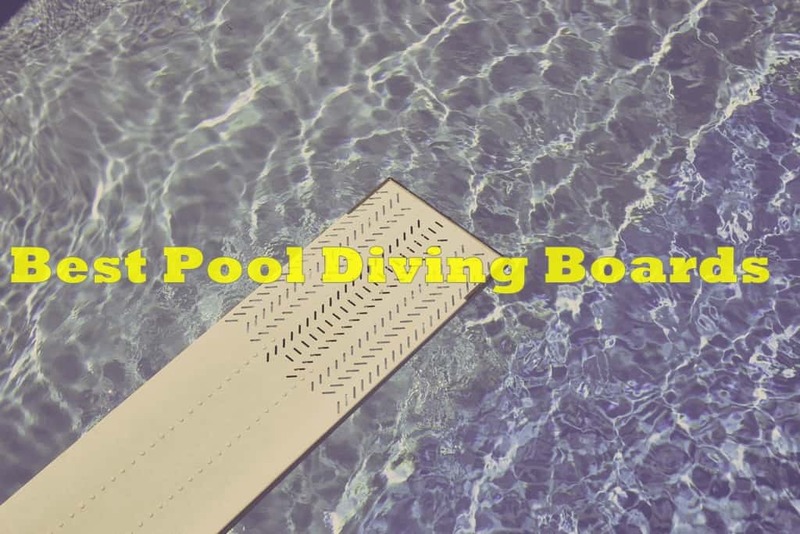 Everything you may look for in a diving board are all here. All you need to do is buy, install and enjoy hours on diving and swimming with the whole family. Copyright 2018 by The Rex Garden LLC.